I’ve been running Eclipse Juno regularly since the M5 milestone. One of the things I’ve really noticed is that the default theme for Eclipse Juno on Mac OS X blends in better with other Cocoa applications than Juno looks on my Windows machines. 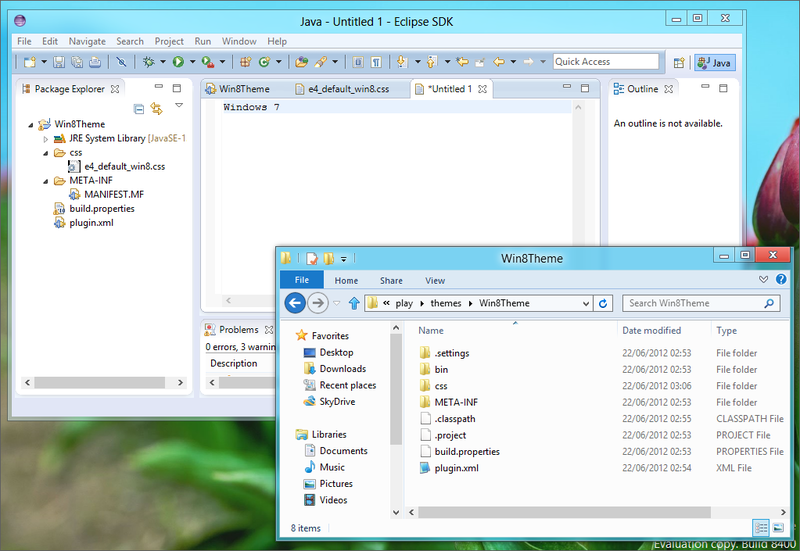 Today I just realised that this is because Eclipse is picking up the Eclipse “Windows XP Blue” theme by default. Below is a picture of Juno RC3 with a Windows Explorer window over it for comparison. To change the theme, go to Window, Preferences, General, Appearance and select Windows 7. This looks a lot better on my Windows 8 Release Preview machine as shown below. Needs a bit of playing with (for example, I’ve noticed that swapping themes in Eclipse works a lot better if you explicitly override things like the background images that have been used previously in themes in that Eclipse session rather than just leaving them not set). What do you think? If you are interested the CSS is below but it’s just a subtly changed version of the default win7 theme. Anyway, lesson from this is to at least change the theme in Juno on Windows 8 from Windows XP Blue to the Windows 7. The jury is still out on my customized stylesheet above – I’m sure someone with some actual design skills could do better.